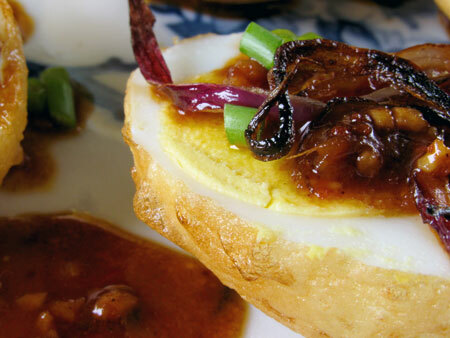 This Thai recipe for Son In Law Eggs is one of my favorite ways to use boiled eggs. It’s a pretty unique boiled egg recipe that most Americans don’t know about. The first time I made them for my husband he literally yelled “WOW!” at how good they are. Although this isn’t a completely authentic Thai recipe, it’s really close and easy enough for any home cook to make. I first had Son In Law eggs in the 7th grade. One of my teachers was Japanese, and her fiance was Thai. Apparently they both liked to cook so she would often bring us different snacks they had made. On Boy’s Day she brought us Son In Law Eggs and told us the most popular theory for the origin of the name. 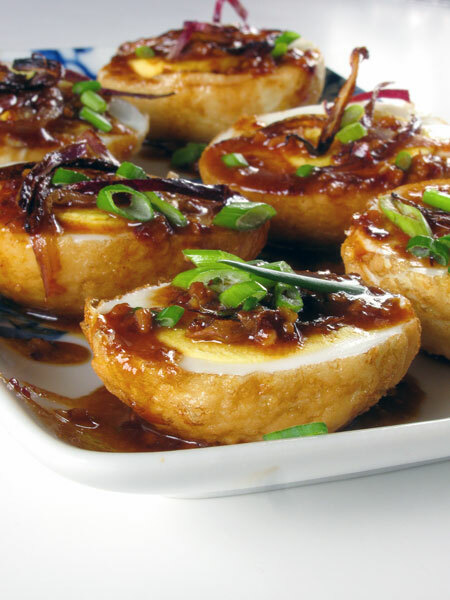 There are a couple different stories on the history of Son In Law Eggs, but the most common is that if a man wasn’t being a good husband, his mother in law would come over and make this dish of deep fried boiled eggs. The dish was insinuating that if he didn’t shape up, his um, er… “egg shaped man parts” (is that family friendly enough? ), would be substituted the next time she made it. We were completely scandalized! 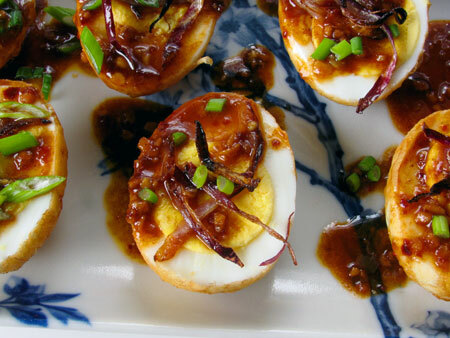 What makes this dish really amazing is the tamarind sauce spooned over the top of them. Tamarind is quite tangy and is used often in Malaysian, Thai, Indian, and African recipes. I didn’t have fresh tamarind or tamarind pulp on hand, and our car is dead so I can’t go to the store, so I used a tamarind soup base. You can buy this soup base at most grocery stores, and I often toss one in my cart to use a seasoning in different sauces, soups, or curries. You can also add a soup packet onto your next Amazon order for only 99 cents! Also, the recipe is normally made with fried shallots, but I had red onions at home which are a great substitute. 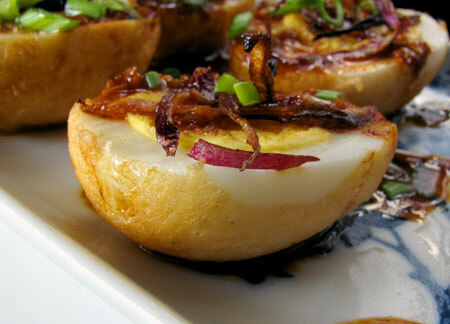 So when you’ve got some boiled eggs on hand (here’s my post on easy hard boiled eggs) give this recipe a try. It’s ready in about 15 minutes and super cheap to make. Plus it’s sure to impress anyone you serve it to, well unless it’s your son in law! Heat a pot of vegetable oil (about 2 inches) on high. In a sauce pan, heat TBS of canola oil on medium and add garlic, tamarind base, and sugar. Mix well. When mixture begins to bubbler add peanut butter, red pepper, fish sauce, and water. Mix again then turn heat to low. Your pot of oil should now be hot enough. Use tongs to carefully lower peeled boiled eggs into oil. Fry until outside of eggs are crispy golden brown (use tongs to turn them if not completely submerged). Remove from oil with tongs to paper towel lined plate. Separate slices of red onion. Use a slotted spoon or wire skimmer to lower onions into pot of oil. Fry until brown and crispy. Remove immediately with same spoon or skimmer to paper towels. Remove skillet with tamarind sauce from heat and stir it. Slice eggs in half, arrange on a plate yolk up. Drizzle with tamarind sauce and top with fried onions and chopped scallions. Approximate cost/serving: Six eggs are only $1-$1.50 depending on what farm or store we get them from. With the other ingredients it comes out to a little less than $2 but we’ll round up. That means if you serve this as an appetizer and everyone eats one egg, it’s only 33 cents a serving! Vegetarian/Gluten Free: This does use fish sauce and eggs, so it’s not vegan, but if you eat fish and eggs it’s good to go. For gluten free you might want to use tamarind pulp rather than the soup base which contains MSG. I’ve never heard of these before, but I can already tell I’d be hooked on them! They look amazing. They are very good. My Thai ex-wife made them, now I do. I am intrigued! I am saving this recipe for some time soon. These eggs sound very interesting. I wish I would have seen this recipe last night. I did a tea and savory party. This would have went over very well! I am going to trust you on these. I have never heard of deep frying eggs but I just bookmarked this recipe in my “recipes to try” folder. I am also going to try your egg salad recipe when my kids come home. I love hard boiled eggs and I love mayo but have always gagged at egg salad. Your recipe looks promising. This is one of my favorite dishes–I used to make it once a week. Though I’ve seen a lot of variations, I’ve never seen one with peanut butter. Very interesting. I may have to try it. These sound awesome! I am sitting here cracking up though over the possible origin of the name–TOO funny! I’ve always seen that tamarind soup base, but never used in. Can’t wait to try it! I made these several years ago and loved them. Must do it again. Don’t remember if my wife liked them. I will inflict them on her again perhaps.